A staircase connects two subsequent floors therefore, it cannot be monolithically casted with them since the formwork and the reinforcement implementation as well as the concreting are done firstly at the subjacent floor and after a few days at the superjacent floor. The most usual way to construct a staircase [*] NoteThe most practical and economical method is the use of a completely prefabricated reinforced concrete staircase fitted inside the structural frame. In earthquake resistant structures, the staircase is an element strongly affected by the seismic forces therefore, the installation of a pricast staircase in an already constructed structural frame is a sensitive task. It requires special attention in order to provide an adequate support and accurately predict the effect that its installation will have to the structure. The precast staircase can be installed upon the load bearing system either after the frame construction of both two floors, supported by special starter bars, or during the construction of the super-jacent floor, supported by starter bars fitted only to the subjacent floor. is together with the superjacent floor. 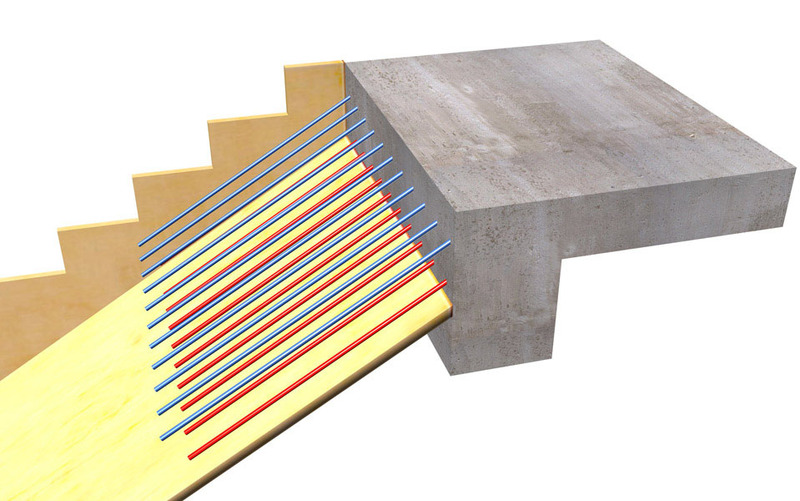 However, in order to achieve a connection with the subjacent floor there must be properly placed starter bars. 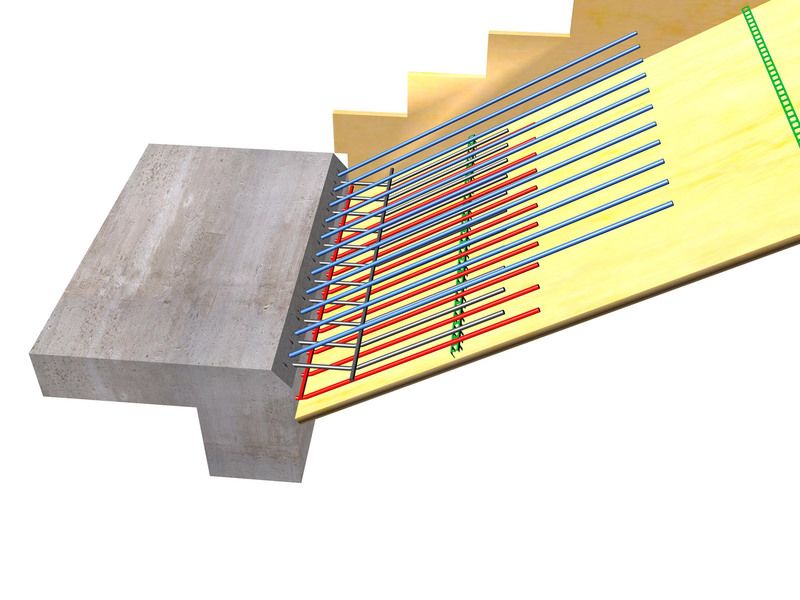 Moreover, starter bars must be positioned and at the superjacent floor for the staircase of the next level. The following describe the practice followed for the positioning of starter rebars in the subjacent and the superjacent floor. The landing reinforcement is extended towards the direction of the staircase for the next floor whose formwork and reinforcement implementation as well as its concrete casting will be car-ried out in a following phase of the construction. 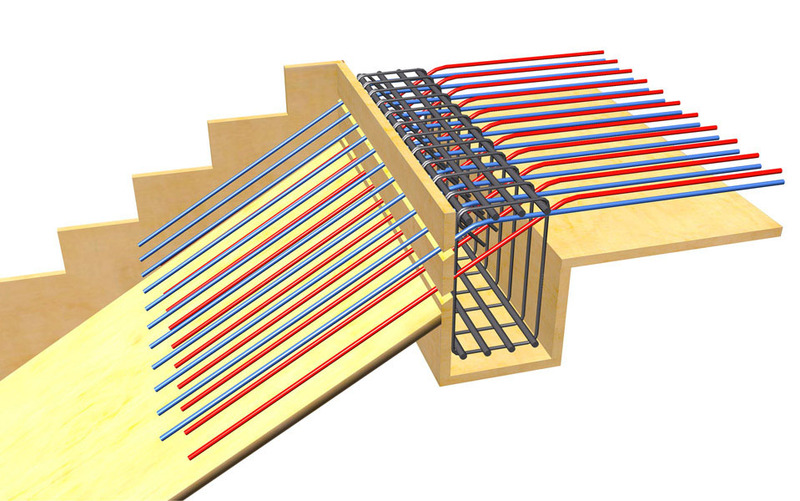 The proper position of the starter bars is secured between thin formwork strips. 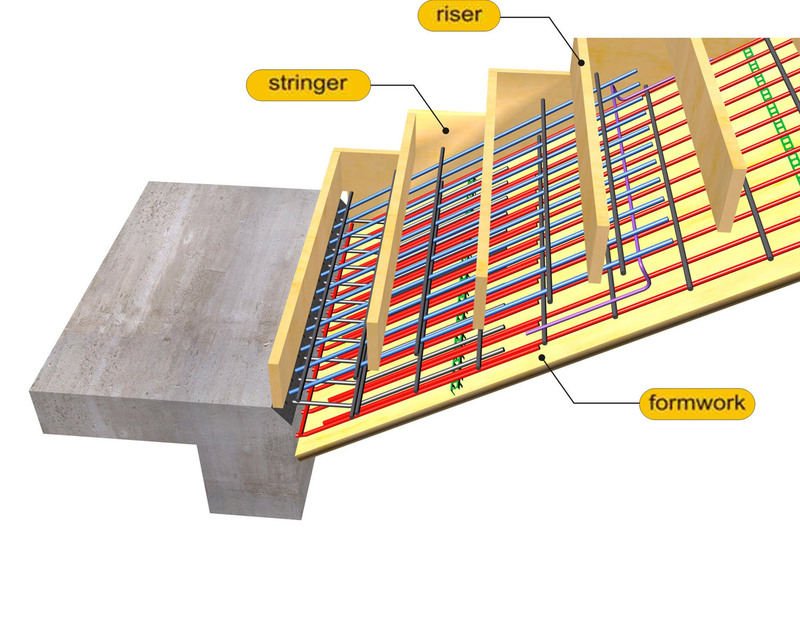 Before the positioning of the staircase’s formwork (planking), the starter bars are properly bent at the necessary height (of course they could be implemented as already bend-up bars how-ever, this entails accuracy difficulties). 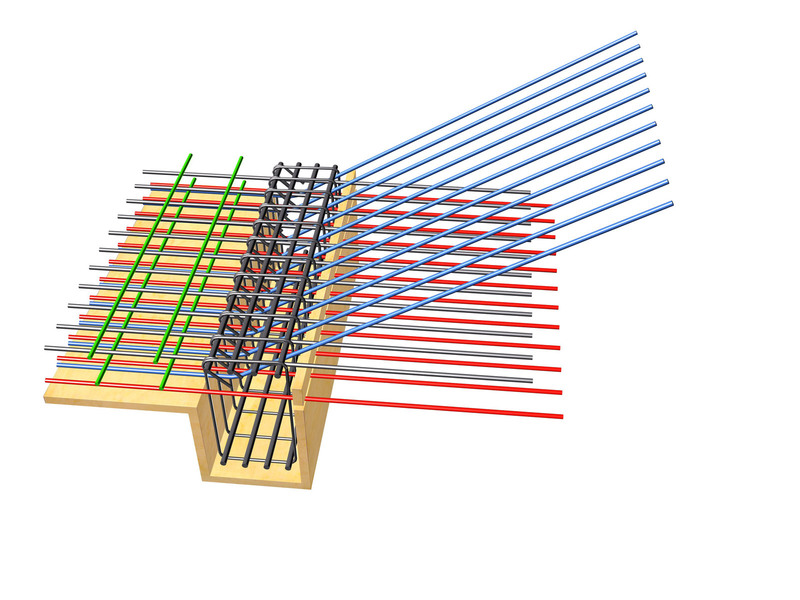 During the final phase of the staircase’s reinforcement implementation, the lower rebars (in red color) are wired to their proper position with the distribution bars. The next phase includes the positioning of any necessary additional upper rebars followed by the placement of their distribu-tion bars. The stringers and the risers are placed last. At the top part of the staircase, the reinforcement is normally implemented based on the fact that the staircase will be monolithically casted with the slabs-beams of the floor. Generally though, it is necessary to place starter bars for the next staircase. The staircase that will be constructed in a following phase will be supported upon those starter bars and the starter bars of the lower floor.